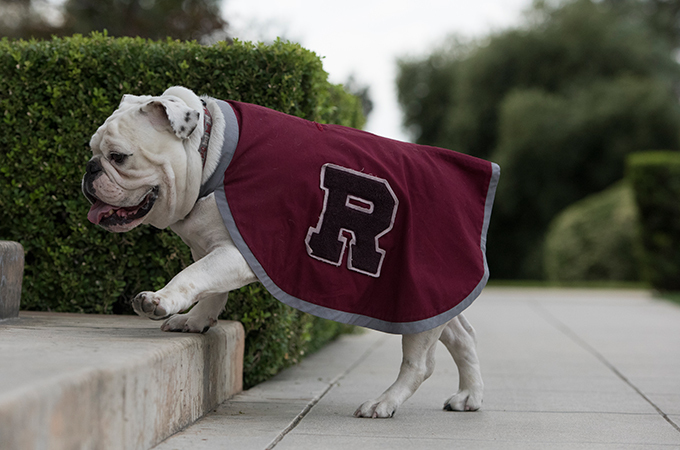 Now that he’s 8 years old, the University of Redlands’ official live bulldog mascot is the equivalent of about 55 in human years, according to the American Kennel Club—older and wiser than his companion, the spry but inexperienced five-month-old mascot-in-training, Addie, whom Thurber is caringly mentoring in U of R mascot ways this academic year. We’ve created a playlist to honor Thurber’s special day with classic songs like “Hey Bulldog” by The Beatles and “Who Let The Dogs Out” by Baha Men. Press play and take a walk over to Thurber Hall to congratulate our mascot on another howlingly successful dog year. Read more about Thurber, Addie, and the University’s 100-year-old bulldog tradition.